Swedish ferry operator Stena Line has renewed its planned maintenance agreement with MacGregor, part of Cargotec. Stena Line has held MacGregor Onboard Care (MOC) agreements since 2008 and its latest contract takes the number of RoRo vessels covered to 39. "Our preventative and planned service products, such as MOCs, make it easier to schedule services; they guarantee that parts are in place and they are very cost-effective for the customer. They take a lot of the stress out of managing the huge service requirements for large fleets," says John Carnall Senior Vice President, Global Lifecycle Support, MacGregor. "The number of vessels covered by the contract requires MacGregor to coordinate complex resource requirements in several countries. There are few companies as well-placed as MacGregor to deliver this demanding level of service commitment." Stena's renewed MOC agreements ensure that key equipment - from MacGregor and a range of other manufacturers - on board the vessels is maintained in good order at the optimum time, minimising the risk of downtime. Remedial measures can be used to rectify a problem with minimal impact on availability. The agreement covers annual inspections, condition surveys, spare parts stock inventories and basic equipment adjustments. "Over the years, Stena has steadily increased the number of vessels covered by the contract from 20 to 39 vessels," says Magnus Göransson, MacGregor Branch Manager for Denmark and Sweden. "This is testament to the long-standing trust that has developed between MacGregor and Stena Line and in MacGregor's ability to deliver technical support, services and spare parts whenever and wherever they are needed." 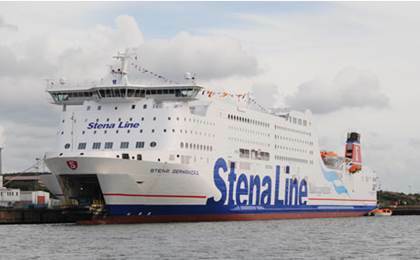 The contract covers ferries serving operations for Stena Line Scandinavia AB, Stena Line BV and Northern Marine Ferries Ltd; sailing on 22 routes in the Baltic Sea, North Sea, the English Channel and the Irish Sea. Each MOC agreement is tailored to meet the needs of individual operators. MacGregor is in the process of developing a new service agreement concept that will simplify service commitments for customers even further. It will be available early next year.